حجم هذه المعاينة: 800 × 508 بكسل. الأبعاد الأخرى: 320 × 203 بكسل | 640 × 406 بكسل | 962 × 611 بكسل. English: Detail of The Adda Seal. The figures can be identified as gods by their pointed hats with multiple horns. The figure with streams of water and fish flowing from his shoulders is Ea (Sumerian Enki), god of subterranean waters and of wisdom. Behind him stands Usimu, his two-faced vizier (chief minister). At the centre of the scene is the sun-god, Shamash (Sumerian Utu), with rays rising from his shoulders. He is cutting his way through the mountains in order to rise at dawn. 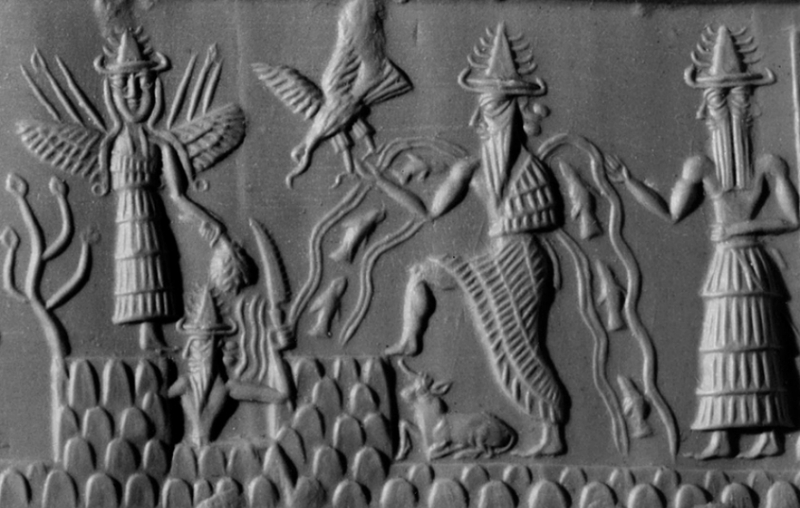 To his left is a winged goddess, Ishtar (Sumerian Inanna). The weapons rising from her shoulders symbolise her warlike characteristics. يجب أن تكون أعمال الملكية العامة من حق المؤلفي في كل من الولايات المتحدة وفي بلد المصدر للعمل من أجل أن تكون مستضافة على موقع كومنز. إذا كان العمل ليس عمل الولايات المتحدة، يجب أن يكون لدى هذا الملف بطاقة حقوق التأليف والنشر إضافية مما يدل على حالة حقوق التأليف والنشر في بلد المصدر.